Rockers, leather boys or ton-up boys are a biker subculture that originated in the United Kingdom during the 1950s among motorcycle riding youths. The rocker subculture came about due to factors such as the end of Post-World War II rationing in the UK and a general rise in prosperity for working class youths, the recent availability of credit and financing for young people, the influence of American popular music and film, the construction of race track-like new arterial ring roads around British cities, and the development of transport cafes that became their natural haunts. These factors coincided with a peak in British motorcycle engineering. 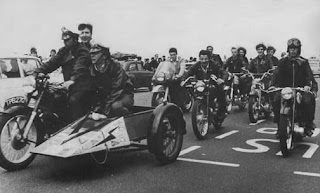 Although rocker-style youths existed in the 1950s, they were known as the Ton up Boys because ton-up was English slang for driving 100 mph (160 km/h). 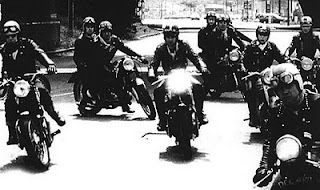 It wasn't until the 1960s that they became known as rockers and they were immersed into rockabilly music and fashions and began to be known as much for their devotion to rock and roll music as they were for their motorcycles. ‘Cafe Racers’ The term originated in the 1950s and 1960s,when Rockers often frequented cafes, using them as starting and finishing points for daring road races. A cafe racer is a motorcycle that has been modified for speed and good handling rather than for comfort. Features include a single racing seat, low handle bars (such as ace bars or one-sided clip-ons mounted directly onto the front forks for control and aerodynamics), half or full race fairings, large racing petrol tanks (often left unpainted), swept-back exhaust pipes, and rear set foot pegs (to give better clearance while cornering at high speeds). 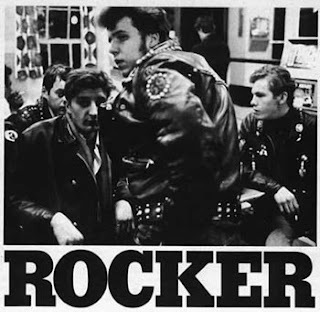 Rockers generally bought standard factory-made motorcycles and stripped them down, tuned them up and modified them to appear like racing bikes. They raced them on public roads and travelled to cafes such as The Ace Cafe, Chelsea Bridge tea stall, Ace of Spades, Busy Bee and Johnsons. 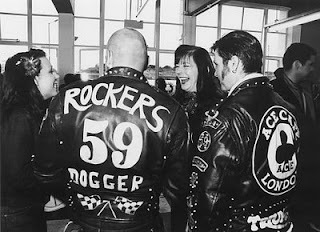 Largely due to their clothing styles and dirtiness, the rockers were not widely welcomed by venues such as pubs and dance halls. This attitude remained prevalent in the UK until the early 1990s, when there was a notable change in the demographics of motorcycle riders in the country. The rocker fashion style was born out of necessity and practicality. 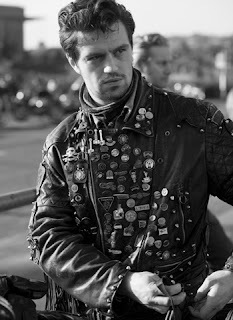 Rockers wore heavily-decorated leather motorcycle jackets, often adorned with metal studs, patches, pin badges and sometimes an Esso gas man trinket. 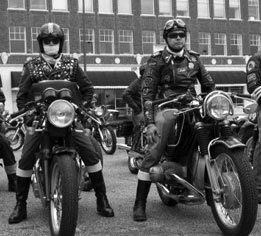 When they rode their motorcycles, they usually wore no helmet, or wore a classic open-face helmet, aviator goggles and a white silk scarf (to protect them from the elements). 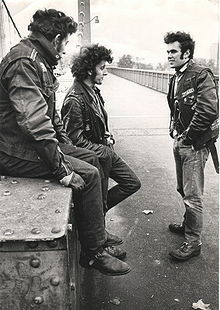 Other common items included: T-shirts, leather caps, Levi's or Wrangler jeans, leather trousers, tall motorcycle boots (often made by Lewis Leathers) or brothel creepers. Largely due to their clothing styles and dirtiness, the rockers were not widely welcomed by venues such as pubs and dance halls. Rockers also transformed rock and roll dancing into a more violent, individualistic form beyond the control of dance hall management. They were generally reviled by the British motorcycle industry and general enthusiasts as being as an embarrassment and bad for the industry and the sport.